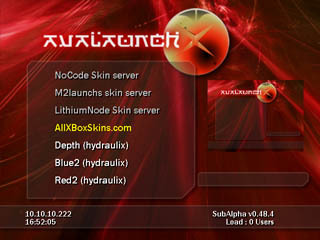 Here you see a listing of the available skins servers that you can use directly from the Avalaunch dashboard. Avalaunch allows you to setup several listings of shoutcast servers to cycle through, or gives you the option to put .mp3's directly on the xbox, and have them begin playing as soon as the xbox boots. You can also setup your Voice over IP Phone here to talk to your friends with an XBOX Live headset. By pressing down on the left joystick button, you can start, and then cycle through your personalized shoutcast servers. Tired of looking through ftp sites and websites, wondering when your dashboard will be updated? That's all in the past thanks to the Dashboard Update option. At the press of a button it checks to see if a newer version of Ava is available. 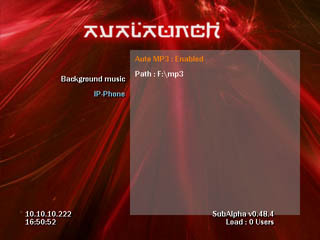 If so, it grabs a set of files from the avalaunch servers and compiles it into a fresh new .xbe for avalaunch. By doing this all on your xbox, we take the legal responsibility out of our hands, thus allowing us to keep these files online for you! Think of it as a patch slightly packed down with an huffman algorithm method for improved size, it unpacks it and end up with a large file with locations and commands like insertblock, deleteblock, replace and such. Not very efficient, but at least it's a legal update.